April 8, 2019:Come join us at some of this summer's greatest gaming conventions! Wednesday, 6/12 12PM-4PM Die GLocke: The Race Against Time Cthulian Monsters on the loose! Quantum Black Operatives randomly disappearing!! Can you save Quantum Black before it is too late? French Resistance agents search the Catacombs beneath Paris for the famed Philosopher’s Stone. Terror awaits them in that city of the dead. January 2, 2019: Our new book, Quantum Black: Dark Designs is now available for purchase at DriveThruRPG and Studio 2 Publishing. June 8, 2018: Quantum Black Dark Designgs Kickstarter Launches: Our Kickstarter launched today. Check it out! We appreciate your support. April 28: 2018: Come join us at some of this summer's greatest gaming conventions! Update: events in green are sold out as of May 22 for Origins. 355 Wednesday, 6/13 6 PM-10 PM Quantum Black Case 026: Night of the Shoggoth An elite Quantum Black team is called in to investigate a research facility that has suddenly gone silent. Ponies have begun disappearing from Ponyville around the same time that a mysterious performer has arrived in town. Update: events in green are sold out as of June 3 for Gencon. Girra, Quantum Black's advanced drone research base has been decimated! Operatives killed! Research has been stolen! Who did this & why? March 25, 2018: We'll be at Who's Yer Con! This year Scott will be running 2-hour adventures on Saturday at Who's Yer Con. May 28, 2017: Our GM Screen is up on DriveThruRPG.com. April 26, 2017: Gencon Schedule: Come Join us at Gencon! Play with lead creator Scott and co-author Ron. Update: events in green are sold out as of July 6. After a terrible accident, an elite Quantum Black team finds itself trapped and in more trouble than it bargained for. Can it save the world before it’s too late? Fun filled action-horror! April 25, 2017: Origins Schedule: Come join us at Origins! Lead creator Scott and co-author Ron will be joined by Alex. Note, Alex is a fantastic GM who tends to run more mature, darker games, than our normal setting. Our schedule is below. Update: events in green are sold out as of June 3. 8202 Wednesday, 6/14 6 PM-10 PM Killing Time After a terrible accident, an elite Quantum Black team finds itself trapped and in more trouble than it bargained for. Can it save the world before it’s too late? Fun filled action-horror! April 24, 2017: The revised edition of our Core Rules book is not available on DriveThruRPG.com. March 12, 2017: We've updated the downloads on the website. We have brand new versions of quick reference sheets for character creation, ritual magic, and sanity attacks. These convenient PDFs let you print off the most commonly used parts of your book for easy reference as player aids, saving wear and tear on your book. In response to demand, we also have created a PDF of the iconic charcters from the Core Book. This lets you easily print off copies for your game. January 30, 2017: Our revised copy of the book is almost wrapped up. We're waiting on proof copies from the printer. We've already sent a corrected copy to Kickstarter backers and to people who have bought it on DriveThruRPG. We'll have a new listing for it soon on DriveThruRPG. The book with be available from our distributor in a month or two: we'll let you know when it is. It will likely be in stores by April, and it will be available at Origins and Gencon. We have a variety of updates. First, let’s talk about the core book. We learned a lot putting out our first book. However, it was our first book, and if we had to do things over again, we would do many things differently. We ran into many unexpected problems during production. We became focused on doing whatever we could to get the book out as close as possible to the date we gave our Kickstarter backers, and we ended up rushing a few places. Now that the book is out, we have been listening to feedback and looking it over again. After much thought, we decided to take the time to reissue our first book. Our newly revised book more accurately reflects what we wanted from the book and what we will produce in future books. The revised book features several improvements. We corrected editing errors. Various errors crept into the text during production, and we have thoroughly gone through the book and corrected those. We have completely revised the layout and design of the book, starting over from scratch. The new book looks significantly different. We have chosen new, cleaner typefaces and fully justified the text. The tables have also been altered to a much improved, easier to read style. The entries for horrors also are much easier to read. We also eliminated most of the unused white space in the book. These changes allowed us to reduce the page count of the book. This has also allowed us to reduce the cover price of the print copy by $5.00 as well, to $44.99. We’ll be reissuing the revised version of the book with a new ISBN number soon. The revised version of the PDF has been put on DriveThruRPG.com and will be sent to Kickstarter backers soon. Anyone who has purchased the PDF of the book though DriveThruRPG.com should now have access to the revised PDF. Over the next couple of months, we will be adding more bookmarks and internal hyperlinks to the file. We will have more updates soon about our second book. July 27, 2016: We have a variety of future products planned and in the works. Please check out the Products page. June 21, 2016: We had a blast at Origins and our book sold well. Thanks to everyone who played games with us and who bought copies of the book! June 4, 2016: Our first book is now on sale. PDFs are available at DriveThruRPG. Hard back copies are available through Studio 2 Publishing, whether through direct purchase or from your local game store. May 6, 2016: Come join us at Gencon! Below are the events we will be running. We've partnered with our good friends at Exile Game Studio to bring you a variety of events this year, as listed below. Update: events in green are sold out as of May 30. April 6, 2016: Come join us at Origins! Below are the events we will be running. Update: events in green are sold out as of May 30. March 26, 2016: We have been hard at work. Finalizing the print copy of our book has taken longer than anticipated, but it is completed and at the printers. We are also finishing arrangements for Studio 2 to serve as our print distributor and DriveThruRPG as our PDF distributor. We will announce when our book is available for sale. January 1, 2016: We've been posting most of our news on our Facebook page. But here is a quick summary: our Kickstarter was succesful, and we are almost done with the book. We'll post information about availability and pricing as soon as we have it. July 28, 2015: Lots of news today! First, our Kickstarter is live, and raising money. Please help us out! Second, we have set up a chat at RPG.net on August 14th at 9:00 PM Eastern Time. Come chat with us! Third, we've posted a new entry in our Designer's Blog where we answer why the default setting for Quantum Black is to work for a corporate team. July 25, 2015: Our Kickstarter preview link is up. You can preview it now, and you can show your support by participating in the Kickstarter when it opens on July 28th. July 19, 2015: We introduce you to another archetypical character, accidental occulstist Xander Baines. July 10, 2015: We've posted a look at one of our archetypical characters, former bad cop Nate Pulaski. July 7, 2015: We've added another game at Gencon! A Quantum Black adventure will also be featured in the Ubiquity system's Grand Tournament at Gencon. Play in the tournament and have a chance to win a Quantum Black t-shirt. April 16, 2015: We have a lot of activity going on. We're excited to announce that Nikolai Ruskin is the artist for our first book! The cover is almost done, and Nikolai is currently working on the interior art. March 1st, 2015: We'll be running games at Origins and Gencon this year. Come join us for a game. 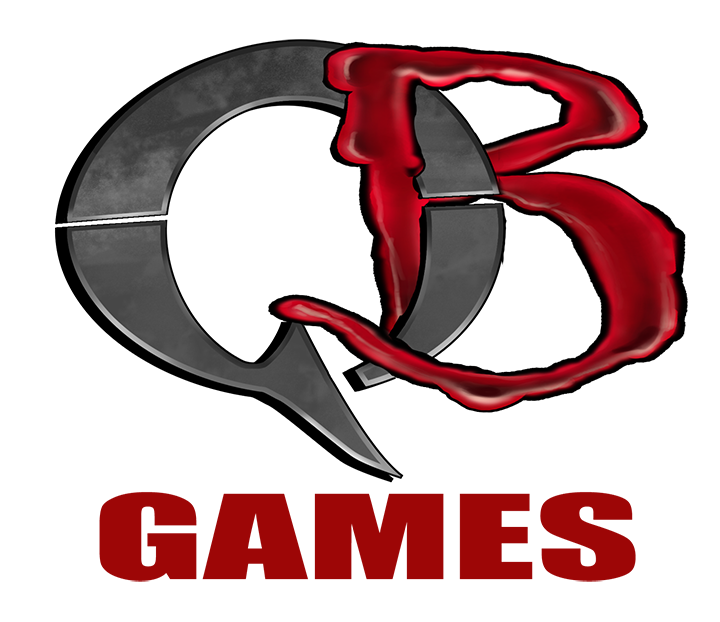 We'll officially be running games under the banner of Exile Game Studios, the creators of the Ubuiqity System that powers Quantum Black. More details to follow. February 1st, 2015: We're preparing to launch the Kickstarter for our first book. Copyright © 2015-2018, Quantum Black Games LLC. All Rights Reserved.